The world is clamoring for connected vehicles, even with their persistent cyber security and privacy issues. What does the future of V2X have in store? Connected vehicles are mainstream. They are prime time. But they are not really ready, in more ways than one. That is a generally accepted reality when it comes to security, which was confirmed again at this week’s RSA Conference in San Francisco. There is plenty of evidence—a continuous stream of stories about how the computers and sensors used to control most of the functions of today’s modern cars have software vulnerabilities that can be hacked and exploited to cause anything from relatively harmless mischief to physical injury or death. Indeed, the amount of computer control in vehicles is staggering. Adams said a Dreamliner jet has about 6.5 million lines of code, while a Ford pickup has about 130 million. That truck also has about 100 different chips, more than two miles of cable and 10 operating systems. 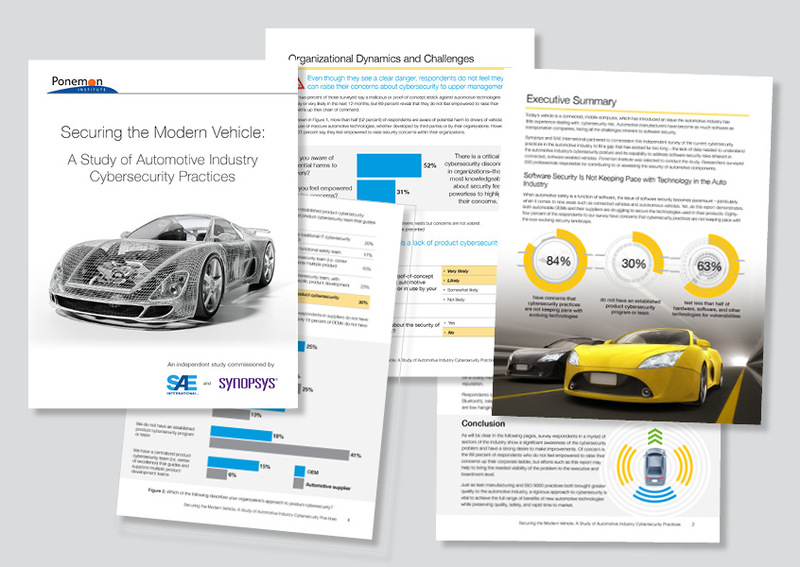 And as a recent report sponsored by Synopsys and conducted by the Ponemon Institute titled Securing the Connected Car: A Study of Automotive Industry Cybersecurity Practices found, software security is not keeping up with the technology of the automotive industry. According to the report, 63% of respondents from the industry said they test less than half of their hardware, software and other technologies for vulnerabilities. Only 10% have an established cyber security team. The prime time problem also exists with privacy. Vehicle-to-vehicle (V2V) communication technology, now increasingly being called V2X (vehicle to multiple other things like traffic infrastructure), is starting to be installed in some brands, with more to follow. Adams said that in 2017 the federal Department of Transportation (DoT) mandated a move to V2X by 2020 (although the Trump administration has put the mandate on hold) because of carnage on the roads, particularly among younger drivers. Traffic fatalities are the leading cause of death in the 15- to 34-year-old age group, he said, adding that there are more than 40,000 road deaths in the U.S. per year and 4.6 million injuries, costing more than $300 billion. Do the privacy negatives outweigh the safety positives? But multiple privacy advocates contend that the data collection necessary to make that possible will inevitably also become another component of the surveillance state. That view is not unanimous—some privacy advocates say the DoT and the National Highway Transportation and Safety Administration (NHTSA) have made significant efforts to build privacy into the data collection for V2X. It works through a wireless protocol called Dedicated Short-Range Communication (DSRC) that now extends to 300 meters but reportedly is being extended to 500 meters, which connected vehicles would communicate with other vehicles and traffic infrastructure. The DoT is “trying to make us safer,” Adams said, adding that the development of DSRC included provisions to ensure that data collected to make that safety possible would be anonymized and never logged or stored. “It is privacy by design, by default,” he said. But the Electronic Frontier Foundation (EFF) contends that the amount of data involved (10 “messages” per second per vehicle) will enable surveillance, even with efforts to build anonymity into DSRC with so-called “rotating certificate credentials” that would change every five minutes, or 20 times an hour. Jeremy Gillula, tech projects director at EFF, said he hasn’t seen any more recent proposals that would guarantee even “a minimal level” of privacy. And he said if one did, that would create another set of problems—helping criminals to be anonymous. “It’s hard to create a communication system that protects privacy without giving more access to bad actors,” he said. And even with anonymized and minimal data collection, “re-identification is still a risk depending upon the algorithms used, and the other data being used in combination with such data,” she said. Can privacy threats be mitigated at all? And she agreed with critics that, at least so far, there is no way to eliminate privacy risks entirely. 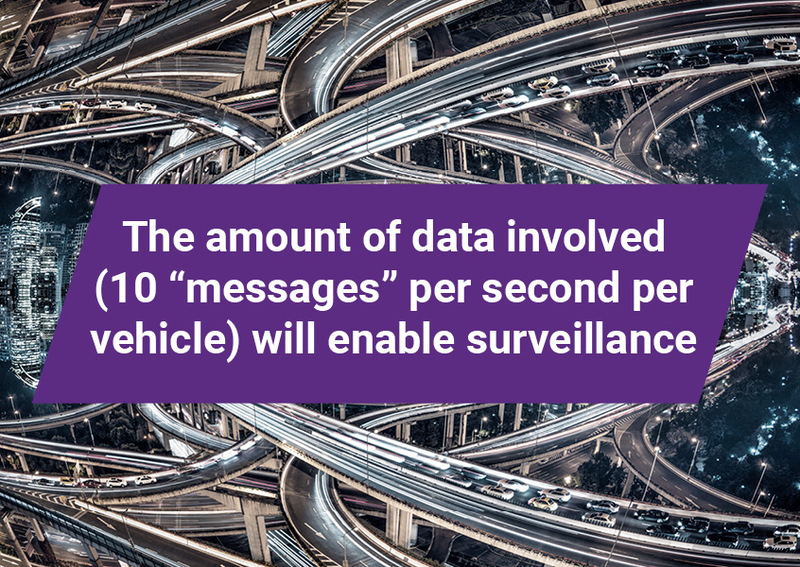 One example is that the data in transit—flying through the air, as Westby put it—from vehicle “messages” won’t be encrypted, because to do so would increase “latency,” or slow down the transmission. And with connected vehicles moving as fast as they do, that would be a problem. A complete rollout of V2X is years away—the entire traffic infrastructure is not even close to being “smart.” But even with the mandate suspended, Adams said, more carmakers are moving to add it voluntarily. He said Volkswagen intends to install it in its entire fleet. Sammy Migues, principal scientist at Synopsys, said it is probably inevitable that V2X will become standard. And he said while technology can enable faster and more comprehensive data collection, the privacy risks aren’t any different from those that have always existed. And he suspects that, ultimately, it won’t just be the DoT collecting the data. “It will simply be sold directly to advertisers, doctors, lawyers, and so on,” he said. This post is filed under Automotive Security.